Now is your chance to select the top film of 2012! Just tell us your favourite Film Circuit release of the past year. 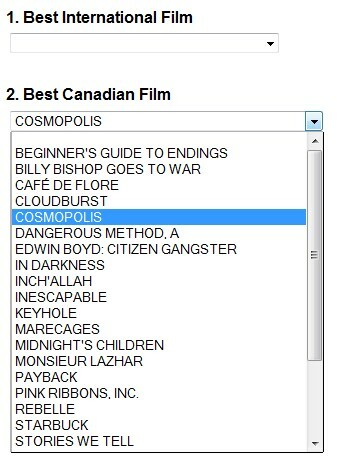 The Canadian film that receives the most votes will be presented with the Film Circuit People's Choice Award: Canadian Film Category. The international film with the most votes is honoured with the Film Circuit People's Choice Award: International Film Category. The Film Circuit People's Choice Awards for 2011, as voted by our Film Circuit audiences, went to Richard J. Lewis's Barney's Version (Best Canadian Film) and Tom Hooper's The King's Speech (Best International Film). CLICK HERE TO VOTE for this year's Film Circuit People's Choice Awards. One lucky voter will be eligible to win $500 for entering.